"I promise to protect you, Ichigo." The above info came from Kaitlin Dougherty, and was edited by yours truly (contact me). The image came from Mewda. 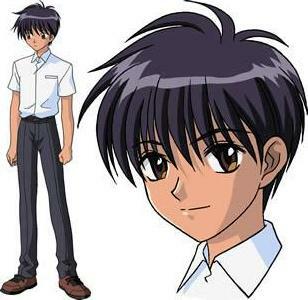 Masaya is a cute, smart, and popular 7th grade boy who is concerned about the Earth's environment. He is Ichigo's boyfriend, and her protector. He's also on the Kendo team. Although Masaya is often calm, he appears to have a lot of worries lurking beneath his surface. He seems to care deeply for Ichigo and finds her amusing. He doesn't find out about her being a Mew until over halfway through the series (episode 38), but once he does, he is alright with it (and says that he knew all along), even vowing to help her in hiding her ears and tail when they come out. Towards the end of the series, Masaya discovers that not only is he the Aoi no Kishi (Blue Knight), but also Deep Blue. The above description came from Kaitlin Dougherty and Sailor_Chibi, and was edited by yours truly (contact me).